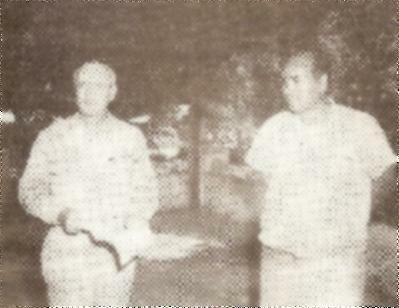 While some confusion seems to exist from previous documents covering the Past President of the Club, and while the local records from 1945-46 show the A. T. Bordallo was President, the documents received from Rotary International indicate that B. J. Bordallo and thirteen Rotarians met with Ben Hardin, and as a result, the Rotary Club of Guam was reorganized on Guam and the charter night presentation held on Thursday, 28 June 1945, show B. J. Bordallo as President. 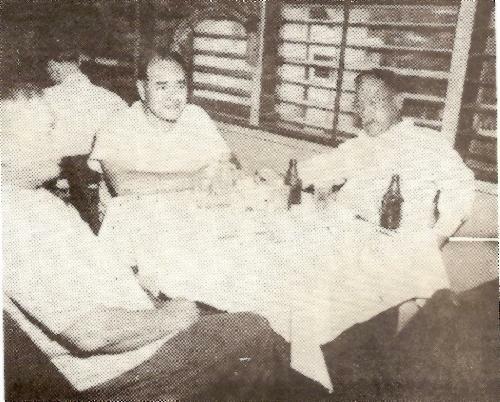 On discussing this with B. J. Bordallo he states that the meeting were held in the homes of the various Rotarians, as well as at some of the military clubs and at the Coconut Grove. B.J. 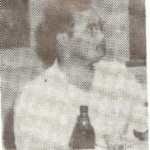 recalls that Jose M. Torres was organist and that he composed a special song for Rotary. Many of the pictures of this period indicate the presence of ladies and children, which coincides with B. J.’s recollection that the Rotary events during this period were socially oriented with the idea of promoting fellowship and international understanding. The Guests of Honor at the re-organizational charter night show that Admiral Chester Nimitz, vice-Admiral Hoover, Major General Larsen and Col. Bleasdale were present. Again, emphasizing the close ties existing at that time between the members of the Rotary Club and the U.S. military forces on Guam. B.J. regrets that the family pictures of Rotary events were all lost in Typhoon Karen, and although many of the relatives of the families of the Rotarians of that time have been contacted, this research has brought forth very little material, and that which has been obtained is included in the appropriate sections of this book. 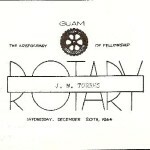 The 3 March 1946 issue of the Navy Times notes that Tom Bordallo presented prizes amounting to $280.00 for an essay contest sponsored by the Rotary Club of Guam. Prize winners in the essay contest, “The New Agana” are congratulated by Virginia Gildersleeve, Dean of Barnard college, Columbia University. The contest was sponsored by the City Planning board in order to combine the desires of Guam’s people into their plans for new city. The winners pictured from left to right are Pedro C. Sanchez, Paul A. Bordallo, Mae E, Manibusan, Rosa P. Santos, Magdalena Macias, Patsy Santos, Teresita L. G. Perez, Segundo T. K. Guerrero, and Francisco S. Uncangeo. Money prizes for the contest were donated by the Rotary Club of Guam. Monetary Prizes amounting to $280 were awarded 10 Guamanian school children yesterday at Agana Plaza for their prize-winning essays on the reconstruction of Guam. More than 600 elementary and high school students submitted essays in the contest sponsored by the city Planning commission to get a cross-section of opinion on what the children of Guam anticipated and desire in the new city of Agana. First prize winners in the three divisions-senior high, and elementary school-were Pedro C. Sanchez and Paul Bordallo, from George Washington high school: and Francisco S. Uncangeo of the Chalan Pago school. Prizes were awarded by Tom Bordallo president of the Guam Rotary Club which helped sponsor the contest and donated most of the prize money. The relation of Agana to the rest of the island was discussed by Sanchez. “Since Agana is the capital of Guam, then all business transactions with the government should be carried on there.” Was the theme of his essay. Other Prize were awarded Teresita L.G. 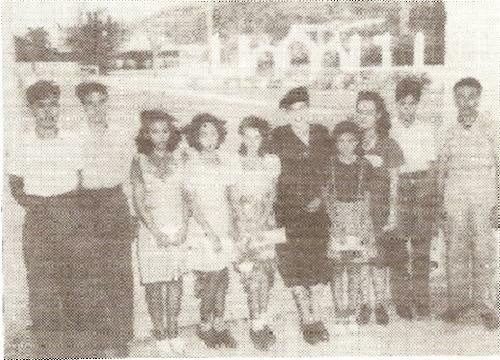 Perez and Francisco San Nicolas, in the senior high class; Magdalena Macias and Mae Manibusan, junior high; Rosa P. Santos of Piti, Segundo T. Leon Guerrero of Sinajana, and Rosa Santos of Santa Rita. The Rotary Club of Guam in cooperation with the City Planning Commission sponsored an essay contest in which 600 elementary and high school students participated. Cash prizes amounting to $280 were awarded by the Rotary club to the 10 children submitting the best essays. The contest was highly successful in achieving its goal of securing a cross-section of opinion on what the young people of Guam desire in the reconstruction of the capital city of Agana which was destroyed in the war.